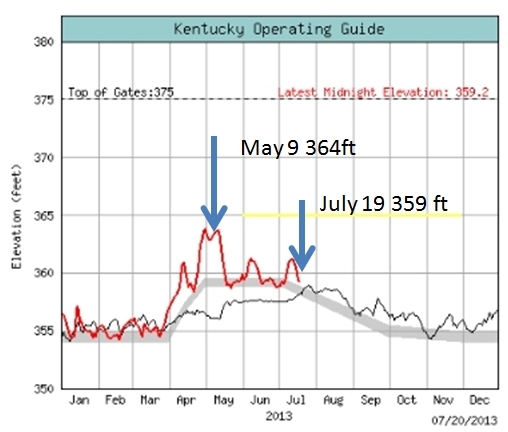 On May 9, 2013 a bass boater team of two was heading north on Kentucky Lake and instead of passing under the main channel of the Eggers Ferry Bridge the operator elected to go under one of the narrower spans west of the main channel. The speed must have been very high as the boat hit an underwater object so hard the outboard motor flipped up into the boat and fatally struck a passenger on the head. The water level on May 9th was about 364 ft. Yesterday, July 19 I went out to the bridge and took these photos. It seems obvious that the bridge’s concrete supports were under water on May 9th, perhaps only a few inches. There are warning signs about underwater obstructions. Boaters that know this bridge know there is lots of water between the supports but between any supports where the steel forms a large X must be avoided at all times. That is where the horizontal concrete beams are located. A possible piece of evidence of the accident is a missing chip of concrete. More here. This accident illustrates the importance of following the main channels magenta line on charts and not taking shortcuts in unknown waters.